President Donald Trump speaks during a meeting with Ukrainian President Petro Poroshenko in the Oval Office of the White House, June 20, 2017, in Washington. Sanctions against the Russians will remain in place until “they are out of eastern Ukraine,” White House Press Secretary Sean Spicer said Tuesday as the Ukrainian president visited the White House. “We’re going to continue to have sanctions on Russia, and we believe that is part of Ukraine, and so therefore those sanctions will remain," said Spicer. Ukraine’s president, Petro Poroshenko, declared himself satisfied with the outcome of White House talks on Tuesday, characterizing the United States as the “most reliable, supportive strategic partner” for Kyiv. “I am absolutely confident that our effective coordination can bring peace to my nation, to my land, and can support our integrity and sovereignty,” said Poroshenko, sitting alongside Trump in the Oval Office. Poroshenko, a billionaire businessman viewed as an enemy by Moscow, arrived without the usual fanfare for a visiting head of government at the White House. Trump did not meet him at the doors of the West Wing as he has done with most other such visitors. The meeting between the two leaders Tuesday at the White House was to “discuss support for the peaceful resolution to the conflict in eastern Ukraine and President Poroshenko’s reform agenda and anti-corruption efforts,” according to a statement from the Trump administration. Ukraine has been engaged in a low-grade conflict for three years with Russian-led separatists in the eastern part of its territory. A successful outcome for Poroshenko’s U.S. visit would lead to American weapons flowing to Ukraine, scholar Taras Kuzio told VOA. Trump’s predecessor, Democrat Barack Obama, decided not to send lethal arms to Ukraine, worried it would escalate the conflict. “The icing on the cake would be Trump no longer following Obama in vetoing the delivery of defensive military equipment to Ukraine. The U.S. under Obama reneged on its moral duty to assist Ukraine's security under the 1994 Budapest Memorandum. Perhaps Trump will rectify this?” said Kuzio, a senior research associate at the University of Alberta’s Canadian Institute of Ukrainian Studies and a non-resident fellow at Johns Hopkins University. “I think it was a mistake” for the Obama administration not to arm Kyiv, a former U.S. ambassador to Ukraine, William Green Miller, told VOA. “We should provide the means for its defense because we’re committed to do that,” said Miller, who served as ambassador from 1993 to 1998 under President Bill Clinton, a Democrat. The White House did not immediately respond to VOA’s request for comment on whether weapons were promised Tuesday by the administration to the Ukrainians. Following the Oval Office discussion Poroshenko on Twitter said “military-technical cooperation was discussed” and more detailed talks would now take place with U.S. Defense Secretary Jim Mattis. Just before Poroshenko’s arrival in the Oval Office, the U.S. Treasury Department announced it had sanctioned 38 people and organizations over Russia’s actions in Ukraine. The latest round of sanctions targets Ukrainian and Russian officials and companies accused by Washington of helping Moscow tighten control of Ukraine’s Crimean peninsula, which Russia, under President Vladimir Putin, annexed in 2014. “These designations will maintain pressure on Russia to work toward a diplomatic solution," said U.S. Treasury Secretary Steven Mnuchin. "This administration is committed to a diplomatic process that guarantees Ukrainian sovereignty, and there should be no sanctions relief until Russia meets its obligations under the Minsk agreements." The two agreements, signed in Minsk in 2014 and 2015, are widely viewed as failures because they did not bring peace and now are not expected to lead to a political solution to the conflict. In order for the U.S. president to clearly understand the situation Poroshenko faces, “Trump should go to Ukraine and the front and witness the war that’s going on,” said Miller, now a Kennan Institute fellow at the Wilson Center. 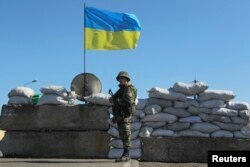 FILE - A Ukrainian serviceman stands guard at a checkpoint near the town of Armyansk in Kherson region adjacent to Crimea, March 21, 2014. Tens of thousands of soldiers and volunteers are on the front lines of the undeclared war, in which an estimated 100,000 people live in a dangerous zone between the two sides. Putin last week said he hoped the United States could play a “constructive role” in resolving the crisis. The U.S. Senate last week approved new measures against Moscow that limit Trump’s ability to roll back sanctions against Russia. The legislation now heads to the House of Representatives. Trump is expected to meet Putin early next month during the G-20 leaders’ summit in Germany. Some of the skepticism derives from Trump’s personal ties to Ukrainians who oppose Poroshenko. The former head of Trump’s presidential campaign, Paul Manafort, did work for Viktor Yanukovych, the former pro-Russian president of Ukraine. 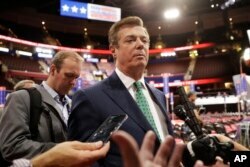 FILE - Paul Manafort talks to reporters on the floor of the Republican National Convention at Quicken Loans Arena in Cleveland. A federal special counsel is looking into the extent of interference by Russia in last year’s U.S. presidential campaign and is believed to be scrutinizing Manafort and others who were part of the Trump campaign.